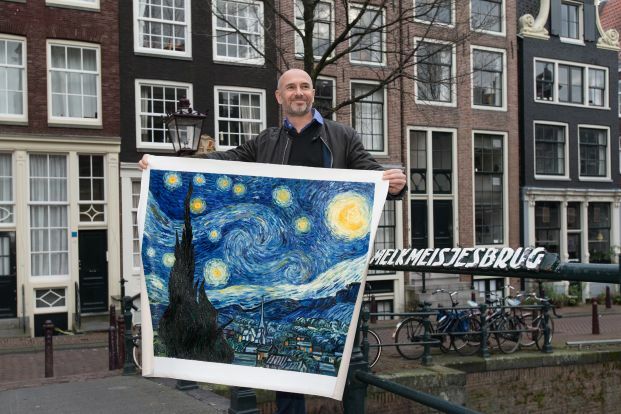 The Starry Night series of paintings is probably one of the most famous and recognizable paintings done by Vincent Van Gogh. Even though the artist made several paintings during his lifetime, this painting is still the one which inspires people the most. 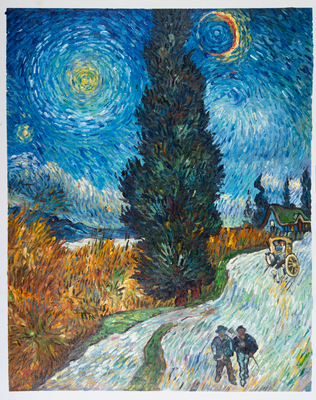 Apart from the main Starry Night painting, Vincent Van Gogh also drew Starry Night over the Rhone and Road with Cypress Star in a similar manner. All of these paintings embrace and celebrate a night full of stars. Vincent wanted to paint a starry night for the same reason he painted wheat fields during the day – he wanted to discover and understand nature. He also wanted to paint at night because of the challenges it brought with the limited lighting. 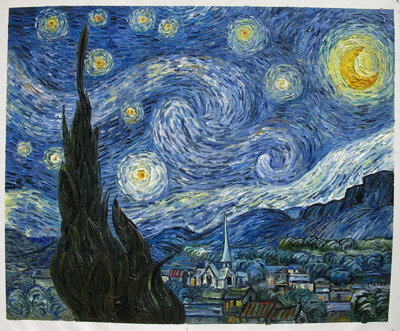 Van Gogh made no less than 21 variations of the Starry Night under different light conditions and weather, just because he wasn’t completely satisfied with the final output. 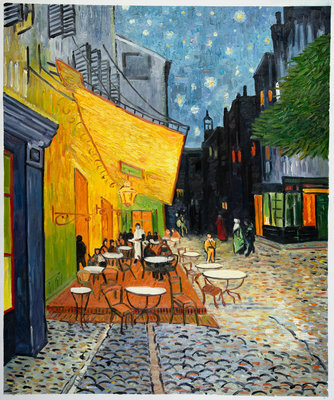 In fact, in a letter to painter Émile Bernard, Van Gogh called this painting a failure. When Van Gogh was supposed to send all his completed paintings to his brother Theo, he held this one back because he was low on postage and he didn’t feel anything about the painting. 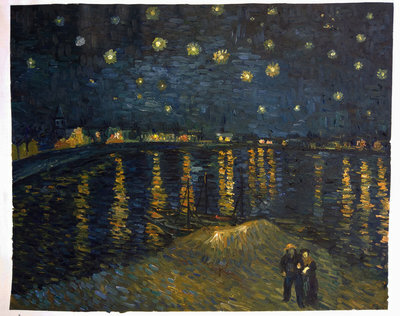 The Starry Night over the Rhone was painted right on the bank of the river Rhone since it was only a two-minute walk from Vincent’s home. Interestingly, the vantage point Van Gogh chose allowed him to capture the reflections of glass lighting over the Rhone and gave the painting a whole another perspective. Supported by supremely talented artists mainly from Holland, the oil reproductions from Van Gogh Studio look just like an original. This is because our artists have analysed Van Gogh’s techniques for several years, and they try to capture every painting’s soul. 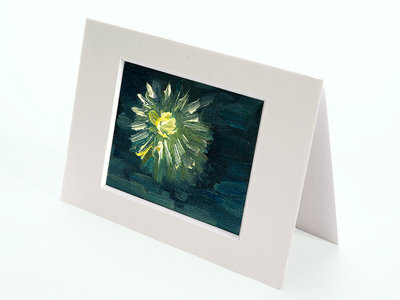 We have delivered paintings to over 20 countries with utmost perfection. But in the rarest of the case, if you aren’t unsatisfied with our services, you can take advantage of our 100% money back guarantee. 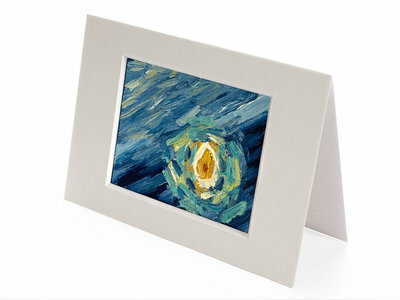 If you want to own a Van Gogh, a Starry Night painting will be a perfect addition to your collection.